In two previous blog posts we documented how auto-liquidators appear to have executed option trades at distorted prices to their clients’ detriment on August 24, 2015. The price distortions were caused by massive sell or buy orders on thinly traded securities being dumped into the market by auto-liquidation programs. These distortions were reversed within minutes, but not before causing investors millions of dollars of unnecessary losses. In “The Recent Market Turmoil Spells Trouble for Auto-liquidators like Interactive Brokers” (available here), We showed that thinly traded long-dated, deep out-of-the money SPX put options were bought on August 24, 2015 at implausibly high prices, purportedly to cure margin deficiencies. We showed the price of one SPX put option increased from $4 to as high as $83 in seconds as a result of auto-liquidation transactions after which the option price quickly dropped back to around $4. These auto-liquidation trades converted an account from a credit balance to a debit balance in seconds when a rational liquidation would have cured the margin deficiency and left the account equity intact. In “More Signs of Trouble for Auto Liquidators” (available here) we explained how rational liquidations would have saved an auto-liquidated account using another stylized example from an account that was liquidated to a debit balance during the morning of August 24, 2015. We used prices of near expiration, at-the-money call options on Barclay’s VXX ETN linked to the VIX index with different strikes to demonstrate the harm caused by auto-liquidations that occurred while an investor was blocked from making trades in alternative strike prices within the same options class. In this post we discuss another type of transaction executed by auto-liquidators which no informed, self-interested trader would execute, because it involves paying as much or more now for a security than it can ever be worth in the future. American-style put options give the holder the right to sell the underlying asset at a fixed “strike” price on or before the option’s maturity date. For example, a call option on the VXX expiring August 28, 2015 of strike $24 gives the owner the right to sell VXX at $24. If VXX closes at $26 on August 28, 2015, the option expires worthless, because no one would exercise their right under the contract to sell VXX for $24 when it can be sold for $26 in the open market. On the other hand, if VXX closes at $22, then the option pays its holder the $2 difference between the $24 strike price and the $22 cost of contemporaneously sourcing VXX in the market. The maximum possible price of a security is limited by the sum of the maximum possible cash flows attributable to it prior to expiration. The highest possible payout the owner of a put option can realize is the put option’s strike price. For this payout to occur, the price of the underlying security on which the put option is written would have to drop to $0 on the option’s expiration date. In all other possible states of the world, the put option’s payoff at maturity is less than the option’s strike price, since the payoff is the greater of the difference between the option’s strike price and the underlying security’s price at expiration or zero. 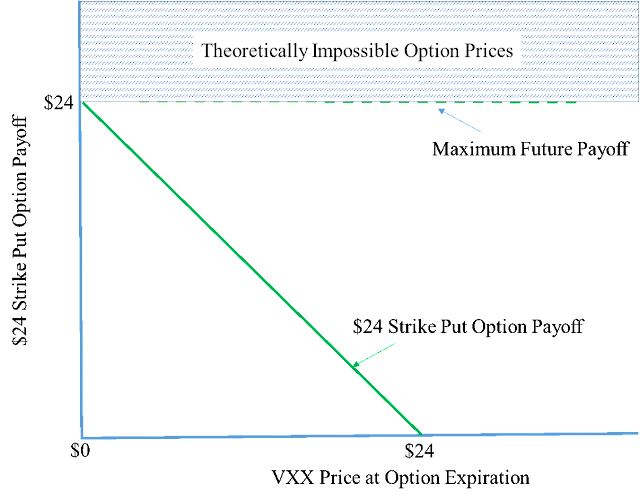 In the example, since the VXX put option with a $24 strike can never pay out more than $24, and will usually pay substantially less than $24, no one would pay more than $24 now for the payoff on some future date. See Figure 1. In a FINRA arbitration earlier this year, Glen Lyon Long-Term Options, LP, alleged that Interactive Broker’s auto-liquidator did not liquidate positions to meet a margin deficit in a commercially reasonable manner. In fact, IB’s auto-liquidation program executed two transactions at theoretically impossible prices. The Glen Lyon account was short these put options and so the auto-liquidation program bought these options ostensibly to reduce a margin deficiency. Table 1 summarizes two auto-liquidation trades executed in the morning of January 12, 2011 in VVUS put options expiring on January 19, 2013. Those long-term, thinly-traded put options had a strike price of $2.5, and hence had a theoretical price ceiling of $2.5. The Glen Lyon account was short these put options and so the auto-liquidation program bought these options ostensibly to reduce a margin deficiency. Table 1: Summary of trades with prices outside of theoretical possibilities. Surprisingly that is not the end of it. In August 2015, there were at least three transactions involving ACI (“Arch Coal, Inc.”) put options with theoretically impossible prices. Table 2 lists the trades executed at prices above the put options’ strike prices. 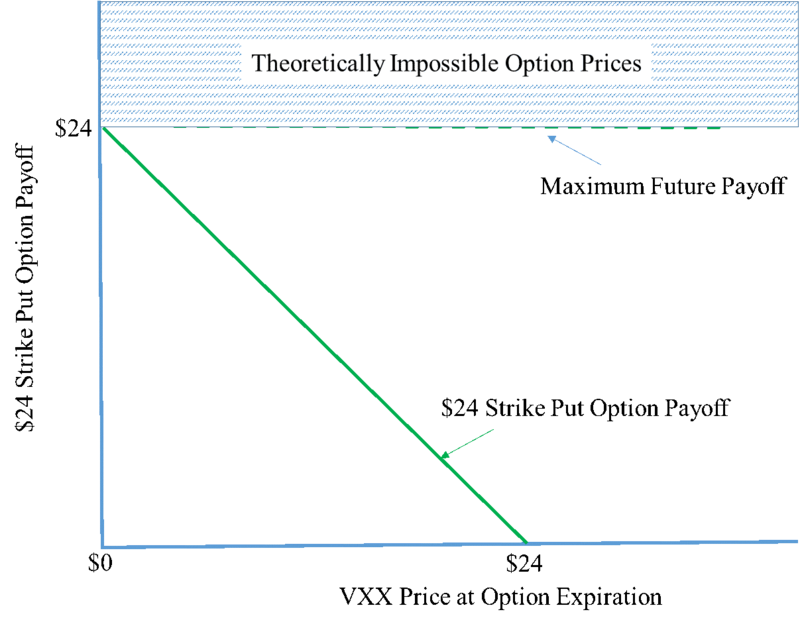 Table 2: ACI Put Options with Theoretical Impossible Prices. We don’t know whether these trades resulted from an auto-liquidation at Interactive Brokers or somewhere else, but they clearly were not executed by an informed trader, since the purchaser paid more than the options could ever be worth in the future.